KG 66-87 (coll. : Gerard Kouradjian, 1987) Argentina, Jujuy, Humahuaca, Aparzo. Origin and Habitat: Bolivia, Argentina. Habitat: Rebutia haagei grows on steeply sloping ground where water rarely stands for any length of time. Mediolobivia haagei (Frič & Schelle) Backeb. Mediolobivia pectinata var. atrovirens (Backeb.) Backeb. Mediolobivia pectinata var. digitiformis (Backeb.) Backeb. Rebutia pectinata var. digitiformis hort. sensu Backeb. Rebutia pygmaea var. digitiformis hort. Rebutia pygmaea var. friedrichiana (Rausch) M.Erikss. Mediolobivia pygmaea var. gavazzii (Mosti) hort. Mediolobivia pygmaea var. gracilispina (F.Ritter) hort. Rebutia pygmaea var. gracilispina FR 1118 Tupiza to Impora, moutains above Mal Paso, pass top, Potosí, Bolivia, 4000 m. (F.Ritter) hort. Mediolobivia haagei var. haefneriana hort. Mediolobivia pygmaea var. haefneriana hort. Lobivia neohaageana var. flavovirens Backeb. 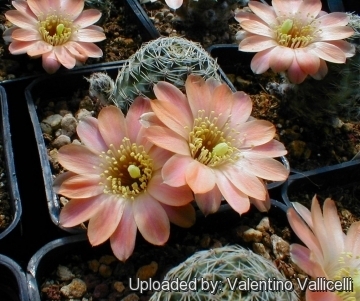 Mediolobivia haagei var. flavovirens (Backeb.) Backeb. Mediolobivia pygmaea var. flavovirens (Backeb.) Backeb. Mediolobivia pectinata var. neosteinmannii Backeb. Echinorebutia pectinata (Backeb.) Frič & Kreuz. Rebutia pygmaea var. diersiana 'rutiliflora' hort. Description: Very small clumping plants. Stems: Individual heads short-cylindrical 2-4 cm wide, 4 cm tall, The colour of the epidermis vary from olive-green to dark purple-green with violet tints. Flowers: Up to 3 cm in diameter and salmon pink. 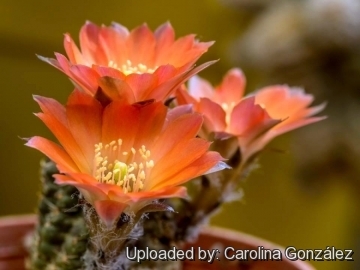 Rebutia atrovirens (Backeb.) Pilbeam: It has a shining, dark green, tuberculate body with a dull violet shimmer and very dark red flowers. Rebutia brunneoradicata F.Ritter: It has a distinctive brow tap root, hence the species epithet “brunneoradicata” (brown rooted). 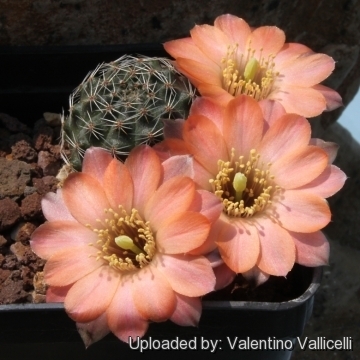 Rebutia canacruzensis Rausch: has pale shell-pink flower with deeper pink throat. Distribution: Bolivia, Chuquisaca, Norrth of Cinti, near Cana Cruz. Rebutia diersiana Rausch: has a distinctive yellow or orangish-yellow flowers. Rebutia eos Rausch: has greyish-green body, brownish spines, darker central spine and flowers varying in colour from pure white to pink. Distribution: Tafna, Jujuy, in the Argentina/Bolivia border. Rebutia gavazzii Mosti: Tiny plant with fat, dark green stem, somewhat offsetting and shiny reddish flowers. Rebutia gracilispina F.Ritter: globose, later columnar, with green body colour, radial spines are very thin, numbering 7 to 10, pectinate, about 2mm long, white, red-brown at the base; Flowers: Intense vermilion to scarlet, stigma yellowish-white. 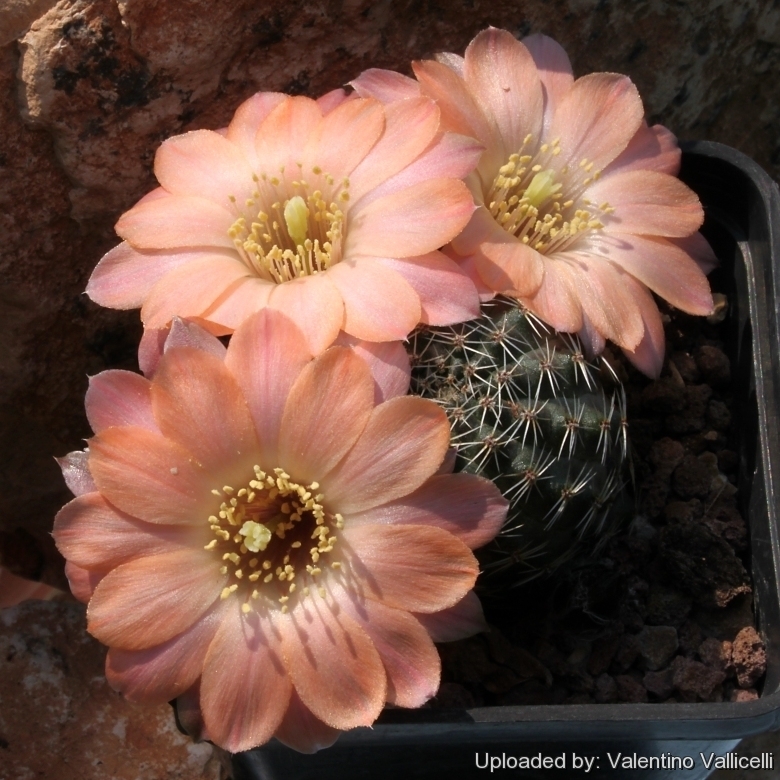 Rebutia haagei Frič & Schelle: Stem olive-green to dark purple-green with violet tints, the spines are glassy-white. Flowers, salmon pink up to 3 cm in diameter. Rebutia haefneriana (Cullmann) Šída: has tiny dark greyish-greem to olive-green stems. Flowers are dusky pink to dark orange or red. Rebutia knizei (Rausch) Mosti: has yellow or orange-yellow flowers with green stigma. The stems is dark-green and take a violet tinge on in the sun. Distribution: Uyuni to Tupiza, Potosi, Bolivia. Rebutia pygmaea (R.E.Fr.) Britton & Rose: Small clumping plants up to 4 cm tall.Body grey-green to dark purple-green, spines short glass-white. Flowers usually salmon pink, it is indeed an extremely variable species that has received numerous unnecessary names. Rebutia pygmaea var. colorea (F.Ritter) Lodé: Has tiny dark olive-green to brownish-violet stems from a tap root that may exceed the size of the plant above soil level. Flowers are bright, electric carmine to purple. Rebutia pygmaea var. pygmaea (F.Ritter): Areoles elliptic; spines spreading, swollen at base. Distribution: Bolivia and northwestern Argentina. Rebutia rutiliflora F.Ritter: It has bright orange flowers. Rebutia tafnaensis (Rausch) Šída: It has bright orange-red flowers. Distribution: La Quiaca, Jujuy, Argentina. Rebutia torquata F.Ritter & Buining: has bicoloured flowers, red with a pale yellow throats and snaky ribs with areoles touching each other. Distribution: Tupiza to Impora, Mal Paso, Potosí department, Bolivia. Rebutia tropaeolipicta F.Ritter: has bright orange-red flowers. Cultivation and Propagation: Rebutia haagei is a summer grower species that is easy to cultivate and recommended for beginners. The whole Rebutia pygmaea complex has delightful flowers and the plants remain compact, and clumps can easily be managed by division. Another advantage is that the plants are very cold hardy in Winter if kept dry. Growth rate: It is a slow growing but easily flowering species that will make clumps given the best conditions. 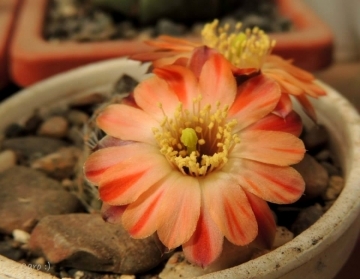 Soils: It likes very porous standard cactus mix soil with a pH slightly on the acidic side. Repotting: This species will occupy a small flower pot comfortably and remain a manageable sized house plant, repotting should be done every other year or when the it has outgrown its pot. Use pot with good drainage. Watering: Needs moderate to copious waterings in summer, but do not overwater (the root system is rot prone) and allow the pot to dry out between waterings. Keep dry in winter at a minimum temperature of 0°C. Fertilization: Feed with a high potassium fertilizer in summer. Exposition: The plant tolerates extremely bright situations but enjoys filtered sunlight or afternoon shade, inside it needs bright light, and some direct sun. Tends to bronze in strong light, which encourages flowering and heavy spine production, but is likely to suffer from sun scorch or stunted growth if over exposed to direct sunlight during the hottest part of the day in summer. Uses: It is an excellent plant for container growing. It always looks good and stays small. It look fine in a cold greenhouse and frame or outdoor in a rockery. but plants in good condition should be nearly pest-free, particularly if they are grown in a mineral potting-mix, with good exposure and ventilation. Rot: This species is particularly easy and accommodating, seldom suffer of cryptogamic diseases. Rot it is only a minor problem with rebutias if the plants are watered and “aired” correctly. If they are not, fungicides won't help all that much. Propagation: Division, direct sow after last frost. Seeds germinate in 7-14 days at 21-27° C in spring, remove gradually the glass cover as soon the plants will be well rooted (ca 1-2 weeks) and keep ventilated, no full sun for young plants! To make a cutting twist off a branch and permit it to dry out a couple of weeks, lay it on the soil and insert the stem end partially into the soil. Try to keep the cutting somewhat upright so that the roots are able to grow downward. Note: It would appear that in cultivation they grow larger and cluster more vigorously than in habitat.